The pretty Polynesian country of Tuvalu is the third-least populous sovereign state in the world. That didn't stop the island nation from getting a team together to compete in the recent Rugby 7s tournament in the Fijian capital of Suva. My sports-mad family joined the scrum of supporters at the all-day tournament of rugby union, which local Pate Tuvata says is integral to the vaka I taukei (Fijian way of life). Although Fiji lost 29-26 to Samoa on the day, the atmosphere in the stadium is ecstatic: there are people standing in their seats, brandishing flags, wearing big, blue wigs and laughing, clapping, heckling and waving. When the team from Tuvalu takes to the field to tackle PNG, the fans really make some noise. “Everyone supports Tuvalu because the islands are sinking,” explains Pate, referring to the country's vulnerability to the effects of rising sea levels. Pate Tuvata, of Korovisilou village. Pate is one of the impossibly friendly members of staff at Waidroka Bay Resort, where we are ensconced for two glorious weeks. The modest boutique resort, located overlooking the Pacific Ocean, only accommodates a small number of guests who are mostly here to surf, dive, snorkel and paddleboard, which is precisely what is so appealing about the place. The fact the majority of the staff live communally in the neighbouring village of Korovisilou also allows for more organic experiences and interactions. 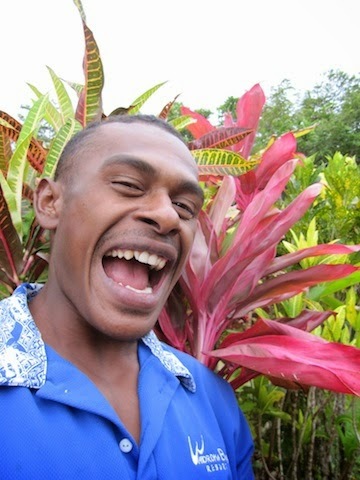 We are encouraged to learn a little of the local language, are invited to drink kava with the chief of the village, Pate's uncle, Ponipate, sit in on a Sunday church service, visit the markets in Suva and to take our children to visit the local school, Ratu Latianara. Principal Vilimaina Bosewaiqa with my son, Fin. 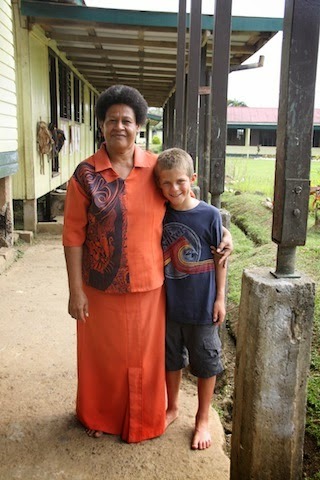 When we arrive at the school we are met by principal Vilimaina Boseiwaqa, who is expecting us, and 300 or so children, who giggle excitedly. “Good moorning Australia,” wail a group of year 2 students, before bursting into a rousing rendition of Kookaburra Sits in the Old Gum Tree. After picking our way through a tangle of children in each classroom, we visit the kindergarten, which has been chosen to pilot an AusAid Disability Inclusive Education project. Although this is no organised tour group, we are still a group of tourists. When I ask Vilimaina if it’s disruptive for us to be here, she becomes quite emotional.“AusAid is looking after us, and that means Australia is looking after us. We now have eight disabled children at our school and the school is going to be renovated. Australia has given them a chance at life,” she says. At 3pm, when the school bell sounds, another international rugby tournament gets under way on the football field as about 50 barefoot boys join the Australia vs Fiji fray. As I sit with Vili and watch the game unfold, on this field pocked with patches of dirt, I know that it is memories such as this – meeting strangers who greet us like friends – that we will most remember about our time in Fiji.